HENLEY businessman Stephen Langford, 43, of St. Anne’s Close, died after an incident in Greys Road — outside Henley Police Station — at around 1.45 a.m. on Saturday 9th December. He suffered head injuries and was pronounced dead at Royal Berkshire Hospital a short time later. Hassan Artik, manager of the Istanbul Kebab shop opposite the police station, said he saw Mr. Langford being given first aid as he lay in the road. Mr. Langford’s death prompted the first murder investigation in Henley for 60 years. During World War II an American serviceman shot his lover at almost the same spot where Mr. Langford was found. Police sealed off Greys Road and the adjacent car park until 5.45 p.m. on Saturday while they searched for clues. Forensic experts scoured the street and worked in a large white tent put up above the spot where the alleged attack happened. Police have conducted house-to-house enquiries and appealed for witnesses. Insp. Jason Purnell, Henley’s senior police office, said: “This is a shocking and tragic incident and my thoughts are with Stephen Langford’s family. Mr. Langford is survived by a six-year-old daughter, Jenny, by his former partner Caroline McDowell, and by son Jack, aged three, by his girlfriend Kim. His parents, Billy and Joan Langford, travelled from Liverpool to be with the family. Mr. Langford moved to Henley in 1985. 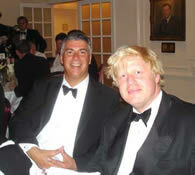 The Telecom sales manager played golf and was a member of Henley Golf Club. He was known for driving a classic Ferrari until it caught fire a few months ago. As a Henley Round Table member, he helped in their charity work and chaired the group in 1997. To drinkers at the Bird in Hand pub on Greys Road, Mr. Langford was known as Liverpool Steve. He would regularly join friends there on Sunday nights and discuss the fortunes of Liverpool Football Club. Flowers have been laid at the corner of Tuns Lane and Greys Road in memory of Mr. Langford. And another just carried one word ‘Daddy’. Mr. Langford’s death stunned Henley and prompted questions about street safety and policing in the town. Supt. Jill Simpson, the area commander of Thames Valley Police, said: “This was a shocking and tragic incident and my thoughts are with Stephen Langford’s family. “Henley is an extremely safe place to live and this was a very unusual incident which has shocked the town. Two local men have been charged with murder. You certainly could not say that about Stephen Langford. He was in the right place — Henley, the town he loved and to which he gave so much. And there should be no wrong time to be on the streets of Henley. Stephen Langford will be remembered by many for his life-affirming exuberance. He was the man who led the commentary at the Round Table fireworks evenings, and he raised many thousands of pounds for charity. I will always remember one particular Round Table evening, when he performed a wicked but good-natured skit at the expense of the visiting speaker, forcing me to scrap my speech and struggle to compose a reply. It was a highly amusing event — and Stephen was at the centre of it. He was a font of Liverpudlian irreverence. Many people across the town will have their own memories, and all will be saddened by his death and troubled by the way he died. Above all we worry about the safety of the streets. The police have assured us that they were on the scene as soon as possible — and that certainly seems to be true. A patrol was there within minutes. The police say it made no difference that the counter at the station was unmanned. Some will doubtless point out that it was lucky, nonetheless, that the patrol happened to be in that part of town. In the coming weeks and months there will be all kinds of conflicting accounts of what exactly happened. But I have no doubt that a good man lost his life — in the prime of that life. Many people’s lives have been blighted by this event. The town of Henley has been at the centre of national speculation and discussion. There is no consolation for us in any of it — except possibly this. Whenever people across Britain have discussed Stephen’s death, they have emphasised how incongruous it is that it should happen in a place as famously trouble-free as Henley. So let us use this time to work, with the police, to clear up the problem of yobbery and rowdiness on the streets. Let us prove that the rest of the country is still right to think of Henley as one of the safest and loveliest towns in Britain. That would be the first and best achievement we could offer to the memory of Stephen Langford. Yes – so sad and senseless. There is no safe place anymore. Not in the UK that I see. This is not acceptable in Glasgow, or Wolverhampton or Henley. Where is the deterrent?? Not in Law. Jaq, you are spot on. There is no safe place in Britain any more and I do not think there has been for some time. There is no deterrent at all as everybody is so keen to rush to the human rights of murderers. If we are going to constantly refuse to punish violent offenders (I mean someone got an eight month SUSPENDED sentance for assulting a child, someone else three years for knifing their wife to death because she wanted a seperation!) we cannot be surprised when thugs think it is ok to beat someone up until they die. The problem is of course that in less than fifteen years these men will be freed and will get to live their lives supported by the state and will likely attack again. Until we vote in a government that will be tough on violent offenders then we can only expect cases like this to become even more frequent. All murders are terrible and my heart goes out to the victim’s loved ones. But I feel we must never succumb to fear, which is what an exagerration of the dangers we face can amount to. Fear I think can attract what it fears. Just think how many people don’t get murdered, or raped, or mugged, everyday. These non-events are not news, even though they are facts all the same. Fear is a conditioned response. We learn to fear as a protection mechanism. And most of us are afraid. Just think how many people don’t see a policeman any day. Before someone suggests the police spend all their time handing out speeding tickets to easy collar motorists, to be sure of getting their efficiency certificates rubber stamped, I think I should point out traffic patrols have been reduced by about 10% under Nulabour. Police spend far too much of their, or rather our, as they ar public servants & thus their time is ours, time filling in forms. “I feel we must never succumb to fear, which is what an exagerration of the dangers we face can amount to. Fear I think can attract what it fears. Everybody succombs to fear everyday, it is a fact of life. This is why we tell young people not to get drunk and go out wearing little clothing-we are afraid they may be raped because of this. This is why we do not let children wonder around on their own, why we do not walk alone in the dark. When does using common sense become living in fear? I`ve said all I have to say on this subject a few times and even I have some pity so I`ll spare you. K yes “When” ..it is a difficult balance to get right.It is especially sad that people are now afraid to intervene . I did enjoy the CCTV pictures of two ladies chasing and hand bagging a thief in the Mirror today . There is life in this “dear people ” as the Queen mum called us , yet. This is just so wrong and shows what a morally bankrupt society we now forced to live in. Today’s legal system certainly goes a long way to protect those who are guilty of such serious crimes and those who operate their lives, whether privately or in business, in a less than honest manner and punishes those who try to be honourable citizens in a country where the government is perceived to prioritise its own political survival, using what ever methods are available to absolve itself of its moral duties. The rights of the average UK citizen appear to matter of little interest to those seeking to maintain their position of authority, given to them by the very people they dis-respect in their duplicitous acts of power hungry greed. Steve Langford was as much a victim of the society spawned from such moral-lacking standards as he was from his attackers. RIP Steve and thoughts are with your family and all those who had had the pleasure to know you. IT’S THE SAME OLD SCENARIO BUT ALAS, NOTHING CHANGES.. THESE STREET URCHINS HAVE NO FEAR BECAUSE IF THEY GET CAUGHT, THEY’LL BE BACK ON THE STREETS WITHIN A FEW YEARS – WHERE’S THE JUSTICE IN THIS COUNTRY?